VoIP service, or “Voice over Internet Protocol,” is officially pervasive throughout our work and consumer lifestyles. Whether communicating with far-away friends and family or keeping up with the non-stop demands of work, we rely on VoIP audio and video communications to stay connected. For users, this is an incredibly hassle-free, simple solution. The same cannot be said for VoIP providers. There are a multitude of variables when it comes to the associated taxes and regulatory fees. 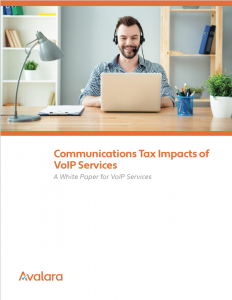 This white paper outlines some of those intricacies and serves to help VoIP providers understand what’s at stake from a communications tax perspective so they can plan accordingly.